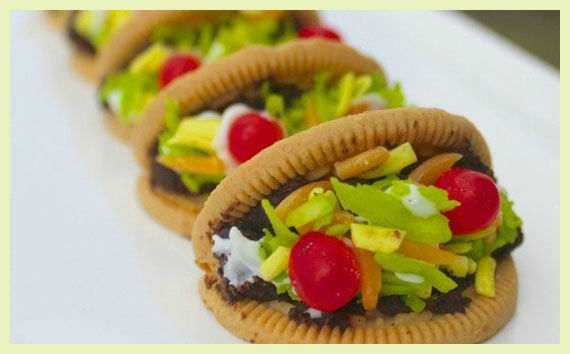 Make these adorable bite-size taco cookies for Cinco de Mayo or any future fiesta! Just a few simple ingredients to assemble — no baking required. 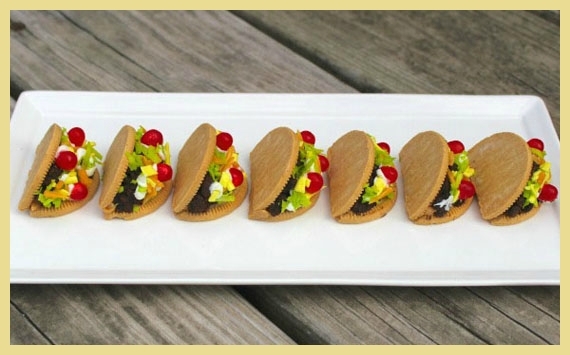 The kids will love to make these fun, tiny "tacos" out of cookies! 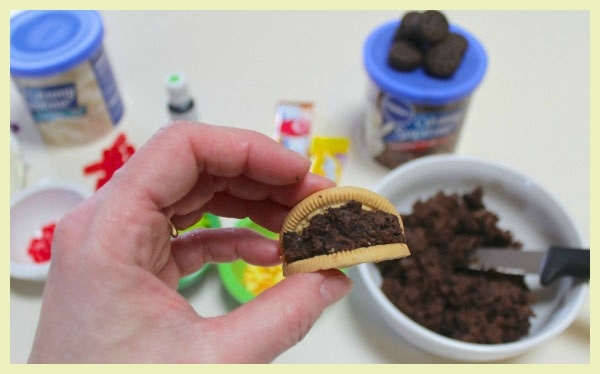 To make the ground beef, mix 1/2 cup chocolate frosting with 1/2 cup crushed chocolate Oreos. To make the lettuce, add 2 drops green food coloring to 1 teaspoon water. Put 1/4 cup coconut in a zip-closed bag and pour green liquid inside. Mix and toss well. To make the cheese, flatten an orange Airhead candy and a banana Laffy Taffy. Cut them up into tiny pieces with scissors. To make the cherry tomatoes, cut off the rounded ends of Hot Tamale candies. 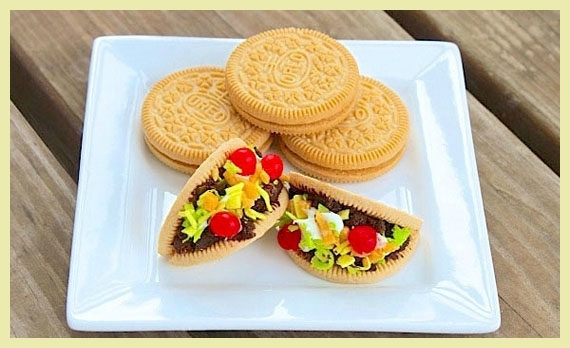 To make the cookie taco shells, remove the top and bottom wafers of the Golden Oreo cookies and scrape off the filling. 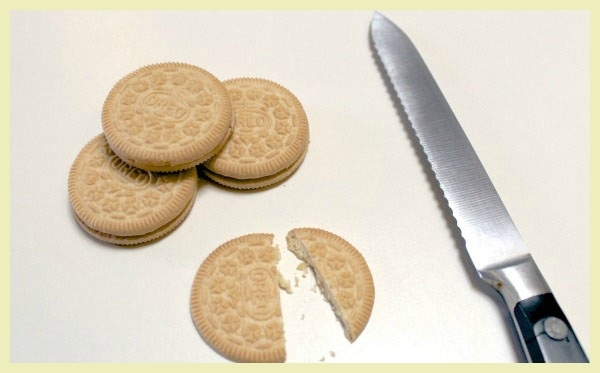 Using a sawing motion with a serrated knife, carefully cut each Oreo wafer just above the Oreo logo (about 2/3). 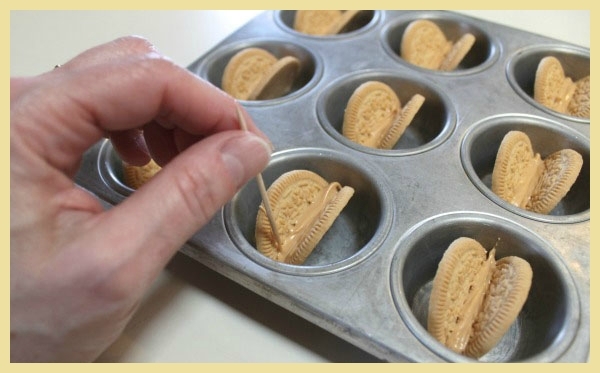 Align the cut wafers inside of a mini cupcake pan to form the angled shape of a taco shell. 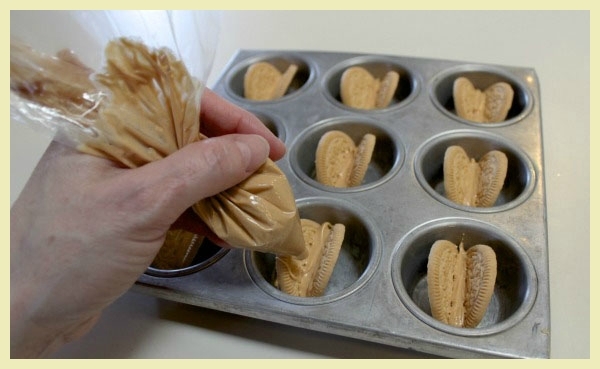 Melt the peanut butter candy melts in a microwave (three, 30-second intervals, stirring between each heating) and pour into a piping bag or plastic zip-closed bag. Cut off the tip and pipe the melted peanut butter candy between the cut Oreo wafers. Smooth out with a toothpick. Allow them to cool a few minutes. 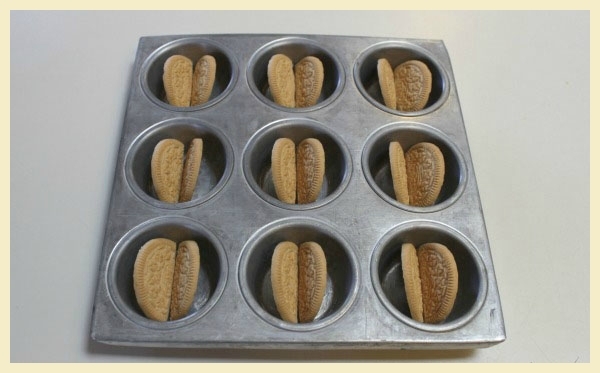 Turn the cookie taco shells over and pipe more peanut butter melt on the bottoms, smoothing the gap shut and securing the two wafers together. To assemble, add the chocolate ground beef first. Pipe a small line of white frosting down the the center and sprinkle the coconut lettuce on top. (The frosting helps keep it in place.) Add a few more dabs of white frosting and sprinkle the candy cheese on top. Add two or three dabs of white frosting to secure the candy cherry tomatoes. Add more white frosting for sour cream, if desired.